Fishing For Customers: Is a Radio Remote Broadcast a Good Investment? Fishing For Customers - Free Small Business Marketing and Advertising Tools, Tips, Articles, Strategies, and Advice. Fishing For Customers: Is a Radio Remote Broadcast a Good Investment? Remotes are traditionally expensive. But as advertising sales remain weak in this economy, advertisers are being offered discounted rates on almost all advertising, including remote broadcasts. And that prompts a critical question: is a radio remote a good investment of advertising dollars? What do each of these people want? His objective is to sell merchandise in such quantity that he can pay for the advertising and still show additional profit for his efforts. The Radio Sales Person translates this instruction. She will arrange all of the crowd drawing techniques at her disposal. These will include a clearly identified station vehicle in front of the store as an attention-getting device. It will be augmented with banners and sound system. She'll provide tee shirts emblazoned with the station logo and other station paraphernalia to give away to listeners who come to the event. She'll try to arrange to have clowns, balloons, and face-painting to attract kids, free food to attract their parents, and the ever-popular “register to win” entry box. (The prize will, of course, be provided by the customer). The Radio Program Director will coordinate. The Program Director's job is to keep listenership high. She hates remotes, considering them to be interruptions to the programming (music), and potentially harmful to ratings. The Program Director will thus limit the number of reports from the scene, limit the length of each report, and do her best to disguise the reports by running instrumental music under the Disc Jockey's voice. The Disc Jockey will be expected to attract a crowd. Feeling pressure from the Manager/Owner and Radio Salesperson, the Disc Jockey will attempt to bribe listeners. He'll repeatedly emphasize “C'mon down. We're having a great time,” and will list all of the free items they could win just for showing up. A few listeners will be impressed by being close to a celebrity. He'll be tempted to talk to those people who come to him, rather than introducing himself to other potential customers. Part of this, believe it or not, is shyness. The results are entirely too predictable. Reacting to the offers made during the broadcast, people will come to the event for the free food, the clowns, the balloons. They will register for the prizes. They will then leave without buying anything. Frustrated by the lack of sales, the Manager/Owner will accuse the Radio Sales Person of bringing the wrong people to his event. The Sales Person will explain to the Manager/Owner the benefits of branding and name recognition. She'll explain the positive effects of today's high-profile advertising might not be immediate, but will definitely impact future sales. Back in the privacy of the radio station she will find fault with the Disc Jockey who spent too much time socializing with fans and not enough persuading them to buy. Of the four people involved, the Disc Jockey will take the majority of the heat when the outcome is disappointing. He's not a seller. He's an entertainer. And even though he feared it might end this way when he agreed to accept the talent fee, he will bitterly resent being held accountable for lack of sales, which he believes are beyond his control. Oddly, the Program Director has the best grasp of the situation. After listening to the Sales Person's criticism, will resolve to discourage future remotes as too much hassle. “Next time sell 'em a schedule of ads” will be her recommendation. By doing her best to hide the event from her own listeners, she's created a self-fulfilling prediction of failure. Unfortunately, the Disc Jockey did attract the wrong people. When listeners hear words like "fun" and "free" instead of compelling reasons to purchase right now, they react accordingly. Equally unfortunate is the Sales Person's claim that future sales will benefit from today's advertising of an event. Although branding and image building ads do take a while to affect customers, and do frequently work better over time, event advertising is quickly forgotten. No immediate sales. No future sales. Conclusion? Most remote broadcasts are a waste of money. Which is why, in general, I don't recommend them. When done correctly they are powerful marketing tools that provide opportunity for greater sales. And at some of the prices we're now seeing, this may be an excellent time to consider adding one, or more, to your marketing plan. In our example the four people involved had mutually contradictory objectives. To have a successful event all four must embrace the same purpose: greater sales during the event. That goal must guide every decision effecting the broadcast. Here's how to assure higher remote broadcast ROI. Mr. Manager/Owner, take a step back. Recognize that you are more excited about the things you sell than the public will ever be. Expect them to be less excited about your remote broadcast, too. Think of it this way: a remote broadcast is not an event. Much like a newscast, it is only coverage of an something newsworthy which is already happening. People want to know the news. A strong concept works well if promoted in the newspaper, on television, or through direct mail. It doesn't require creativity of the medium to make up for lack of customer interest. If your event that exciting, continue planning the remote. If not, abandon the idea. There's no sin in passing up an inexpensive opportunity which won't benefit your company. OK. You have a strong concept. Good. Don't use the station as your only source of publicity. We're not trying to prove this station can draw a crowd. We're focused on attracting as many buyers as possible. Buy a newspaper ad or two. Keep those ads customer focused. The headline should address the primary benefit you're offering. The body copy should say the things your best salespeople say to customers on your sales floor. Put your logo, as well as that of the station, at the bottom of the ad. If your headline catches people's attention, and your body copy offers strong reasons to buy, only then will they care who's making the offer. Miss Radio Sales Person, give your client's business the benefit of your experience. “Great savings throughout the store” is much too generic and won't persuade anyone. Make sure all of the parties agree on a message which is both specific and highly beneficial. Is the proposed remote broadcast the best use of your client's money? As you know, grocery stores make dozens of offers in a “double truck” two-page newspaper layout. They focus so many reasons to buy into a single space every week because it works. If you believe you could create more sales impact with an intense, highly-focused schedule of recorded ads packed into a single time period, do that instead of the remote. The cost to the advertiser is the same either way. Give him the choice with less risk. Miss Program Director, stop compromising. Either refuse to interrupt your music with talk, or commit to making the talk segments so compelling that your music listeners don't want to be left out. Would you refuse to interview the top artists in your format? Of course not. Listeners don't resent talk. They resent people blathering on about topics that don't interest them. You, Miss Program Director are uniquely qualified to find the exciting appeals that your listeners will want to learn more about. Your presentation skills can turn this potentially dull and boring jabber into the most exciting information available on the day of the broadcast. Hype won't work. You've got to dig for genuine value, and then make sure it's presented in a way that helps your listeners imagine themselves owning what the advertiser sells. Schedule three reports per hour during the broadcast. Have the Disc Jockey announce his location during the FCC required legal ID. Require your studio talent to plug the event during each music segment. That works out to acknowledging the remote seven times per hour. Just as you wouldn't allow your station to go a quarter hour without reminding listeners to whom they're listening, this proposed broadcast will also need that frequency of repetition. Give your Disc Jockey the latitude to react with his own personality from the scene, but make sure each key point is included in each remote break by scripting a standard beginning and ending. Here's the part you're going to hate: kill the music bed during reports from the scene. We want people to take note that something unusual is going on. Play a quick attention-getting intro (think fanfare) as he's introduced, and then, other than the Disc Jockey's voice, let the natural ambiance of the event be the only sound. Can you commit to promoting this event for maximum advertiser impact? If not, do both the client and your listeners a favor and offer to help create a persuasive advertising campaign for him instead. Mr. Disc Jockey, your role needs to change. You're no longer being asked to host this broadcast because you're popular and have fans who are likely to come see you. You're being asked to use all of the presentation skills you've acquired in your career to introduce your listeners to the advertiser's business. Why would you do that? Because they will benefit from the resulting relationship. Believe it, or recommend another talent. Use that conviction every time you open the microphone. Get rid of every cliché in your vocabulary – especially those things which you've grown used to saying on similar occasions. Repeating the same old verbiage will only produce the same old results. Watch for customers leaving the store. People who've purchased something are sold on the value of their purchase. If they're reasonably articulate, invite them to briefly answer a couple of questions during your next break. Tell them what you'll be asking, and help them to quickly express their reasons for buying. These people have exceptional credibility with other folks listening to your broadcast. And don't worry about what the station provides for you to give away. We're now looking for different responses from different people than you've invited to past events. Truthfully, you'll make more money persuading people to visit the store who don't care so much about meeting you as they are interested in the client's offer. By the way, shaking hands with everyone in the crowd and personally welcoming them builds listener loyalty in a way nothing else can. Finally, Mr. Manager/Owner . . . The question was, are remote broadcasts good investments? Normally, no. But with the prices now being offered, maybe. If you decide to try it, don't choose a station as your promotional partner because of ratings, or even because of price. Instead, choose a partner committed to getting qualified buyers to your event. You'll know whether you have the right radio station early in the planning process. Get the station's Sales Person, Program Director, and Disc Jockey into a planning meeting. Bluntly ask if the station will commit to the three breaks per hour, plus the legal ID, plus three more mentions by the on-air host. Ask if the station will eliminate any music during reports from the scene. Ask if they are willing to make your broadcast the single most important event on the air. If they are not willing, call a meeting with a different radio station. If they are, commit your resources and schedule the event. And remember that media partners who put your needs first have earned a significant part of your non-event advertising budget, too. 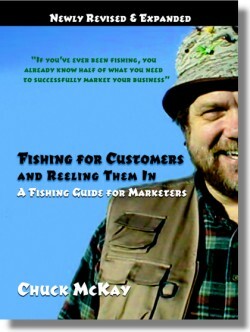 Chuck McKay is a marketing consultant who helps customers discover, and choose your business. Questions about advertising schedules or remote broadcasts may be directed to ChuckMcKay@ChuckMcKayOnLine.com. I've seen (and, sadly, emceed) countless occasions where there was no real plan to succeed. Predictably, the event didn't help anyone reach their goals. I especially appreciated the part about exhorting the business owner to set the expectations with the station's people UP FRONT. That way, the station's sales and programming people can do their best to deliver the value the owner wants and needs. Everyone is on the same page. Really great McKay. Really useful to customers. Especially the section "Here's how to assure higher remote broadcast ROI" will help the customers what to do and what what not to. Fantastic site, very interesting content, boomarked ! I’m really lucky and so glad that after surfing the web for a long time I have found out this information. .This is Barry Hertz the Director of Social Media at MBTA Marketing. Conduct Only One Advertising Test at a Time.